RI-MAN, the healthcare robot, was featured in an earlier article (see RI-MAN And Roujin-Z Robots: Elder Care Fact And Fiction). Since that time, the RIKEN Bio-Mimetic Control Research Center team has updated and expanded the RI-MAN site, giving us more information on this great 'bot. The upper and left forearms of the RI-MAN robot have soft area tactile sensors that measure the magnitude and position of contact force when the 'bot picks up a patient. RI-MAN robot also uses fifteen small controllers that operate the joints of the robot. These controllers perform dedicated motor and sensor control tasks. This distributed controller network avoids the concentration of computational loads on the main computer and also dramatically reduces the wiring complexity. Besides improving speed, it also helps make RI-MAN small and compact. Using simple, cup-shaped "ears", RI-MAN can determine the horizontal direction of sound; changes in the sound spectrum enable judgement of front or rear direction for sounds. The RI-MAN robot can track human faces by integrating auditory and visual information. 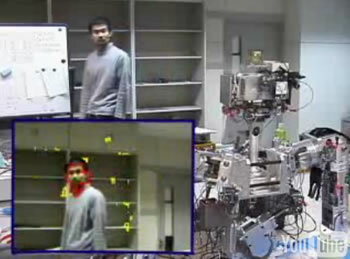 Stereo cameras record the scene; the position of human faces can be extracted. The robot also determines the position of a sound source (like the voice of a human being) using its "ears" as described above. The RI-MAN robot has a gas sensor module that can identify smells that provide important information to caregivers, like the smell of urine from an incontinent patient. The sensing method is based on the nonlinear dynamic output of a gas sensor in response to periodic heating. Differences in dynamic response are used to determine the gas type and concentration. The two sensors installed on the right and left sides of RI-MAN's torso provide the information. Finally, take a look at the video below which provides a good overview of the RI-MAN robot in operation. InTouch Health is now leasing a remote-controlled telepresence robot called The Companion to hospitals and nursing homes nationwide. Hospital robots can go either way, according to sf writers and anime creators. Will we see both? The University of Florida has created what they call "an assistive environment" which goes far beyond the assistive devices that we are used to hearing about. Take a look at the http://www.bmc.riken.jp/~RI-MAN/index_us.html RI-MAN robot website.